From here you have two options for sharing, Link Sharing, and directly giving people permission to share. Link Sharing means that a link will be created which you can give to others, allowing them to view or download the file. 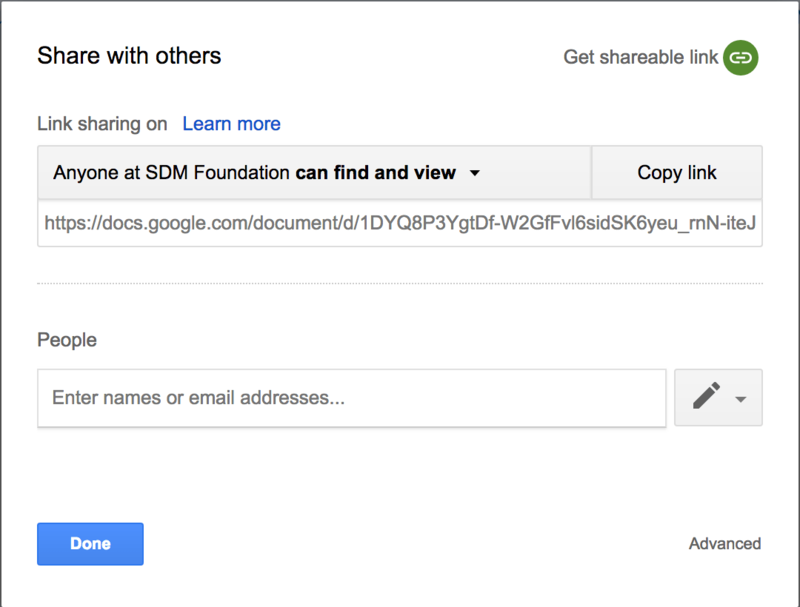 You can also share directly to other people by adding their email to the list of people able to access the document. The advantage to sharing by email is that you can control who has access to the file. With a link, anyone who has access to the link can see the document, and the link can be shared easily with additional people. In the pop-up that appears, click on the down triangle next to “find and view” to choose whether to allow other people to also edit the document. Next you either type email addresses in the “Enter names or email addresses” box and then clicking done, or you can share by clicking “Copy link” and then paste that link into a communication to other people. ← How to connect to wifi on a Mac or Windows computer?